The unripe fruit by Derrick Rowe. 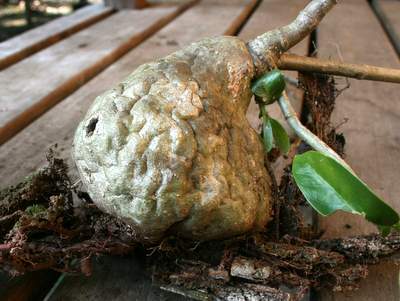 The caudex with entrance by Derrick Rowe. The inflorescense by Derrick Rowe. 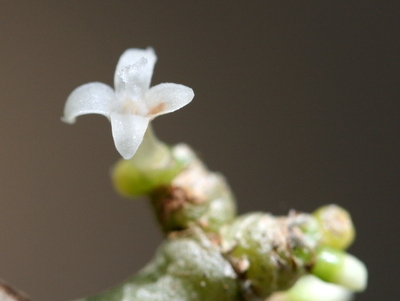 This epiphytic member of the Rubiaceae family was described by Camilla Rose Huxley & Matthew H. P. Jebb in 1991. It is found in the jungles of Papua New Guinea. 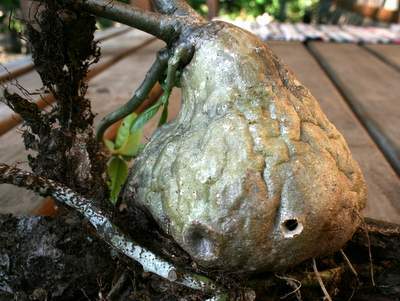 The hollow and rough caudex will grow to 25 centimetres in diameter, the branches reach 50 centimetres in length. The flowers are white on this ant plant, while the fruits are orange-red. Key to the Species of Anthorrhiza. 1a. Spines present on stem… = 2. 1b. 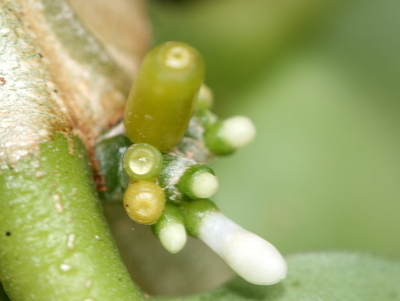 Spines absent on stem or very few… = 7. 2a. Spines largely, but not exclusively confined to the inflorescence forming a cushion in the leaf axils. Leaves 4-10cm wide… = 3. 2b. Spines scattered on stem. Leaves usually less than 4cm wide… = 4. 3a. 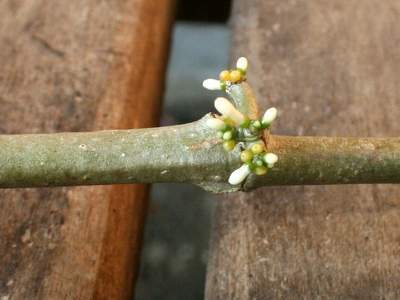 Inflorescence with fleshy ridges separating flower-producing tissue. Spines straight, usually dense on tuber. Corolla lobes greenish white. Anthers cream. = Anthorrhiza echinella. 3b. Inflorescence without ridges of tissue. Spines gently curved, usually sparse on tuber. Corolla white. Anthers blue… = Anthorrhiza recurvispina. 4a. Lamina less than 8cm long, stipules persistent, rounded… = Anthorrhiza stevensii. 4b. Lamina more than 10cm long, stipules caducous (easily shed), triangular or rounded… = 5. 5a. Stem dorsiventral, (flattened + distinct upper and lower surfaces) more spines on upper side, spines light brown to blackish. Leaf margin crinkled. Corolla blue… = Anthorrhiza caerulea. Camilla Rose Huxley & Matthew H. P. Jebb in 1991. Papau New Guinea, 15 centimetres in diameter. One or rarely two, unbranded stems. Pale blue/turquoise flowers. Fruits orange. 5b. Stem radially symmetrical, rarely dorsiventral. Spines golden brown. Leaf margin flat. Corolla white to greenish white… = 6. 6a. Inflorescence bracts leathery, splitting regularly, apiculate, persistent. Petals with long slender lobe tips… = Anthorrhiza chrysacantha. 6b. Inflorescence bracts papery, tearing irregularly, not apiculate, caducous (easily shed.) Petals acute-rounded… = Anthorrhiza camilla. 7a. Inflorescence covered by leathery and papery bracts. Fruit with 4-8 pyrenes… = Anthorrhiza bracteosa. 7b. Inflorescence sunken or covered by a dense cushion of bract hairs. Fruit with 2 pyrenes… =8. 8a. Tuber surface smooth. 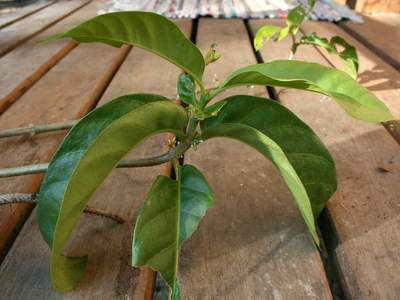 Leaves to 17x7cm. Inflorescence narrowly cordate in outline… = Anthorrhiza mitis. Camilla Rose Huxley & Matthew H. P. Jebb in 1991. Papau New Guinea. Diameter 30 centimetres, height of caudex 26 centimetres Total?. Several unbranched stems. Flowers whit, fruits orange-red. 8b. Tuber surface areolate (roughened by areolae). Leaves to 11x4cm. Inflorescence arch-shaped in outline... = Anthorrhiza areolata. The leaves by Derrick Rowe. The flower by Derrick Rowe.